Western blot analysis of extracts from MKN-45 and SK-N-MC cells, untreated or treated with λ phosphatase for 1 hour or forskolin (FSK) for 30 minutes, using Phospho-β-Catenin (Ser675) (D2F1) XP® Rabbit mAb (upper) or β-Catenin (6B3) Rabbit mAb #9582 (lower). 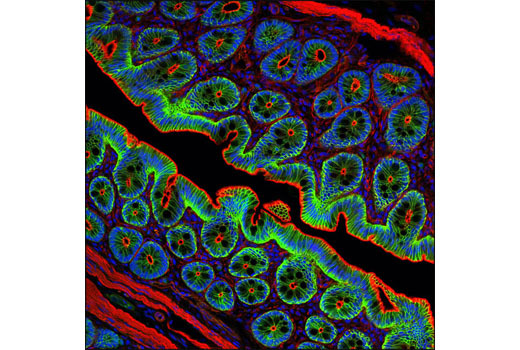 Confocal immunofluorescent analysis of rat colon using Phospho-β-Catenin (Ser675) (D2F1) XP® Rabbit mAb (green). Actin filaments have been labeled with DY-554 Phalloidin (red). Blue pseudocolor = DRAQ5® #4084 (fluorescent DNA dye). 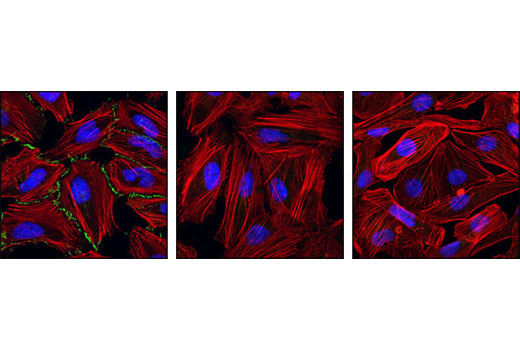 Confocal immunofluorescent analysis of HeLa cells, untreated (left), λ phosphatase-treated (middle), or untreated NCI-H28 cells (β-catenin null; right) using Phospho-β-Catenin (Ser675) (D2F1) XP® Rabbit mAb (green). Actin filaments have been labeled with DY-554 phalloidin (red). Blue pseudocolor = DRAQ5® #4084 (fluorescent DNA dye). 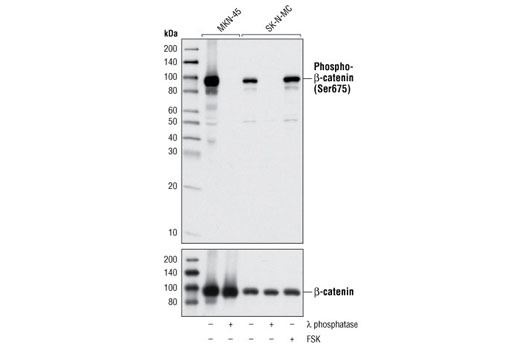 Phospho-β-Catenin (Ser675) (D2F1) XP® Rabbit mAb detects endogenous levels of β-catenin only when phosphorylated at Ser675. Monoclonal antibody is produced by immunizing animals with a synthetic phosphopeptide corresponding to residues surrounding Ser675 of human β-catenin.